StarTech.com 2m Thunderbolt 3 (20Gbps) USB C Cable / Thunderbolt USB DP - Thunderbolt cable - 6.6 ftProvide twice the data transfer speed of any other cable type, enable full 4K 60Hz video, and power your devices with a single cable. This Thunderbolt 3 (20Gbps) cable lets you connect to any Thunderbolt 3 port (USB-C) to deliver video and data to your Thunderbolt, USB, and DisplayPort devices. Plus, the cable can provide power for charging your devices, and you can link up to six Thunderbolt 3 devices as part of a daisy-chained connection. This cable supports data transfer rates of 20Gbps when connected to a Thunderbolt 3 device, so you can transfer photo and video files at twice the speed of a USB 3.1 Gen 2 (10Gbps) cable. For example, you can transfer a 4K movie in less than a minute. When connected to a USB 3.1 device, the cable supports data transfer rates of 10Gbps. The Thunderbolt 3 cable is fully compatible with all of your USB 3.1 (5Gbps) devices and can be used for charging and syncing your mobile devices. You can also connect and power USB-C laptops, such as your MacBook or Chromebook, and USB-C peripherals, such as your portable hard drive and docking station. This Thunderbolt 3 cable delivers up to 60W of power for charging a laptop or powering a display, and 15W for bus-powered devices such as a hard drive enclosure. This Thunderbolt 3 cable can also be used as a USB cable for your USB 3.0 and 3.1 devices, with data transfer speeds of up to 5Gbps. 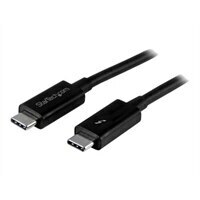 And while regular USB 3.0 and 3.1 USB-C cables allow for a maximum connection of up to 1m, this cable allows for a connection distance of up to 2m. ⚠ WARNING: Cancer and Reproductive Harm - www.P65Warnings.ca.gov. Provide twice the data transfer speed of any other cable type, enable full 4K 60Hz video, and power your devices with a single cable. This Thunderbolt 3 (20Gbps) cable lets you connect to any Thunderbolt 3 port (USB-C) to deliver video and data to your Thunderbolt, USB, and DisplayPort devices. Plus, the cable can provide power for charging your devices, and you can link up to six Thunderbolt 3 devices as part of a daisy-chained connection.